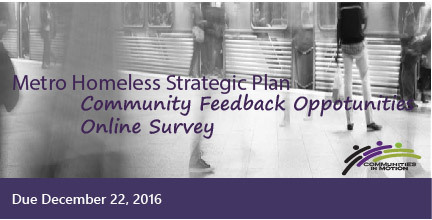 Pro­vide input into Metro’s Home­less Strate­gic Plan! Due Decem­ber 22, 2016! Home­less­ness in the Metro (Los Ange­les Coun­ty Met­ro­pol­i­tan Trans­porta­tion Author­i­ty) tran­sit sys­tem has grown, as it illus­trates the epi­dem­ic of home­less­ness across Los Ange­les Coun­ty. Com­mu­ni­ties in Motion has con­duct­ed exten­sive engage­ment, allow­ing com­mu­ni­ties and stake­hold­ers to pro­vide input. We are also offer­ing oppor­tu­ni­ty for peo­ple to com­plete an online sur­vey. Please com­plete the online sur­vey to ensure tour feed­back is includ­ed. The link below will bring you to the online sur­vey. For more infor­ma­tion about the sur­vey, email us at info! @communities-motion or call us at (424) 320‑0120.